If there was ever a time to start seriously considering consuming cannabis-based commodities — the time would definitely be now. When cannabis becomes officially legalized in Canada on Oct. 17 of this year, companies like Coca-Cola will be demonstrating their dedication to a burgeoning marijuana market through an increase in innovative products. That’s right Canada — we might be getting weed Coke. The soft drink juggernaut is rumoured to be in talks with Aurora Cannabis, Inc., a Canadian licensed cannabis producer, about uniting their efforts to create a line of cannabis-infused drinks. More specifically, the company has been “closely watching” the cannabis market as a whole, and is showing interest in creating products that contain cannabidiol, or CBD, for its use in what they call “functional wellness” beverages. According to BBN Bloomberg, the ultimate goal of this new venture “would likely develop beverages that will ease inflammation, pain and cramping.” While the new line of drinks are not likely to contain the active psychoactive chemical THC, or tetrahydrocannabinol, this transition into any sort of cannabis-centric product is a big step for such a large company. 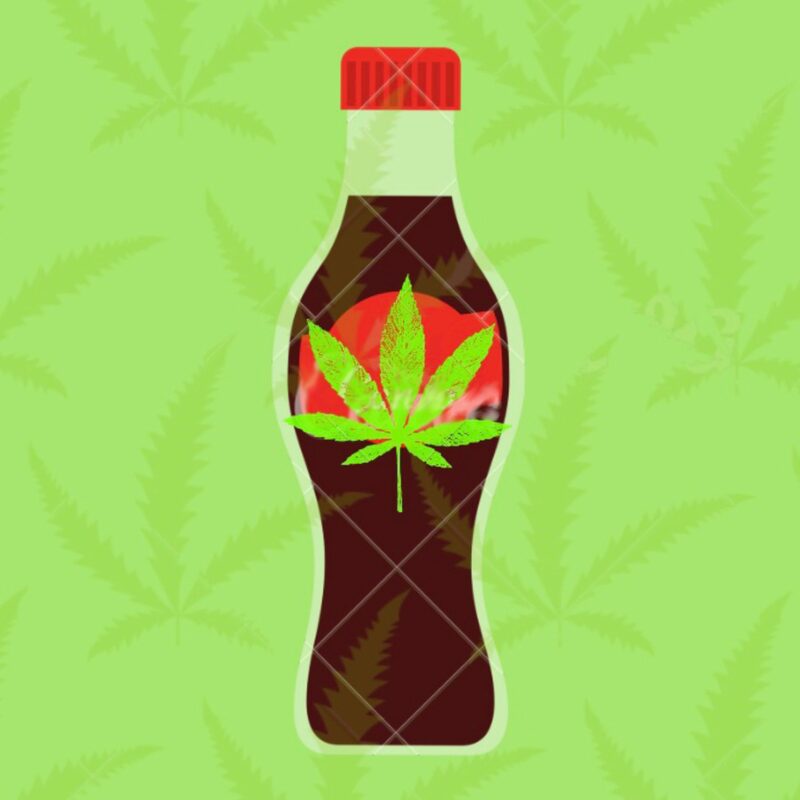 Coca-Cola is already a major success in Canada, which will see cannabis legalization as of October, as well as in American states like California, Nevada, Washington and Colorado — states that currently have legalized recreational use of cannabis and related products.Because of this, Coca-Cola’s transition into a flourishing new market, is nothing short of the intelligent business practice that you could expect from such a successful company. But Coca-Cola isn’t alone in this decision. Molson Coors also has plans to sell a cannabis-infused, non-alcoholic beverage in its partnership with the Canadian-based Hydropothecary Corporation (HEXO). As well, Constellation Brands, the parent company for beer makers like Corona, has already put more than $4 billion into Canopy Growth, another Canadian cannabis corporation. Coca-Cola’s main product measures at a shocking 2.52 on the pH scale, an average of 1.5 lower than acid rain and 1.5 more than sulfuric acid — each point indicating ten times more or less the concentration of acid. Enamel begins to dissolve at 5.5 on the pH scale. Now, I’m not going to give Coca-Cola so much credit as to suggest that this potentially controversial move, one which will inevitably create some anger from the conservative fans of the company, was borne out of a humanistic desire to show its support for the soon-to-be legalized drug. The CBD market in the US is expected to grow to $2.1 billion in the next two years, from a mere $202 million in 2015. Though CBD usage is not federally legal in the US, the legalization of it in multiple states means that this market will only continue to grow exponentially as other states follow through. For a company that has the sheer size and capital that Coca-Cola does, they have the flexibility to embark in such a venture, regardless of how successful it might be — and again, let’s be honest, there’s an extremely good chance of it going well for them — because even if they pull another “New Coke,” nobody is going to be jumping ship anytime soon. There’s a reason why memes about the new suggested Pepsi slogan being “Is Pepsi ok?” exist. But Coca-Cola isn’t off the proverbial hook yet. It’s quite ironic for a company like theirs to be suddenly investing in a series of “wellness products” and it certainly isn’t unexpected. With the cultural trend towards “health and wellness” — a problematic phrase in and of itself — being what it is, Coca-Cola’s shift towards a drink that has historically been marketed to treat a long list of pain-related symptoms. Because of this, the company’s movement into “health” drinks becomes significantly less of a shock and more indicative of a company desperately trying to stay relevant in a “health-crazed” world. I’m definitely going to heavily scrutinize this hybrid “wellness” product that will doubtlessly be marketed in traditional Coca-Cola fashion — as the literal incarnation of joy and friendship.